Pau D'Arco is derived from the inner bark of Tabebuia trees native to both Central and South America. Naturally rich in quinones such as napthaquinones, naphthofurandiones, and anthroquinones, Pau D'Arco has been consumed historically to help promote wellness on a number of levels. 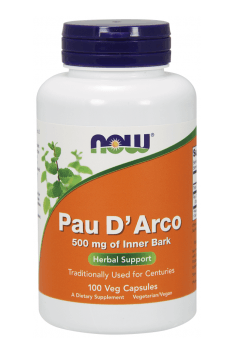 More recent scientific studies indicate that Pau D'Arco helps to support healthy intestinal flora. It has also been sugested that Pau D'Arco may assist the body in supporting healthy cell growth and possesses powerful antioxidant properties. Pau D'Arco 500mg 500mg 100 caps. Two capsules, 1-2 times per day.